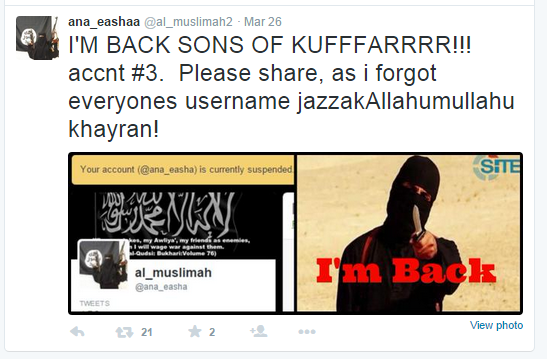 Twitter personality “Ana Eashaa” is a propagandist for ISIS. Eashaa uses Twitter to express support of ISIS, including by bragging about women’s supposed freedom in ISIS-held territory.ana_eashaa, Twitter post, March 30, 2015, 12:32 p.m., https://twitter.com/al_muslimah2/status/582581069452566529. She calls non-Muslims “kuffar” (nonbelievers), the Western coalition against ISIS “cowards,”ana_eashaa, Twitter post, April 10, 2015, 5:32 p.m., https://twitter.com/al_muslimah2/status/586643051868717057. and promotes similarly extremist accounts, including that of Jamaican-based propagandist Abdullah Faisal.ana_eashaa, Twitter post, March 28, 2015, 11:36 a.m., https://twitter.com/al_muslimah2/status/581842383781937152. Eashaa has appealed to viewers to support ISIS by writing of its supposed virtues, including that the terror group distributes goods to the poor and needyana_eashaa, Twitter post, March 27, 2015, 9:12 a.m., https://twitter.com/al_muslimah2/status/581443647645814784. and allows women to drive.ana_eashaa, Twitter post, March 30, 2015, 12:31 p.m., https://twitter.com/al_muslimah2/status/582581069452566529. Eashaa’s accounts were purportedly suspended by Twitter at least twice, but she continues to resurface under new accounts. Eashaa’s first tweet from the @al_muslimah2 account, purportedly Eashaa’s third, garnered upwards of 20 retweets as of June 2015.ana_eashaa, Twitter post, March 26, 2015, 12:49 p.m., https://twitter.com/al_muslimah2/status/581135913381679104. @al_muslimah2ana_eashaa, Twitter, accessed June 24, 2015, https://twitter.com/al_muslimah2. @ana_eashaaana_eashaa, Twitter post, March 26, 2015, 12:49 p.m., https://twitter.com/al_muslimah2/status/581135913381679104. 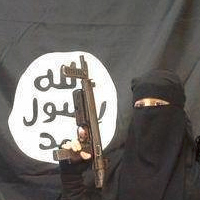 Twitter personality “Ana Eashaa” is a propagandist for ISIS. “Airstrikes in Raqqa today hit during Jumu'ah Khutbah - #WesternCoalition are #Cowards” (Tweet)ana_eashaa, Twitter post, April 10, 2015, 5:32 p.m., https://twitter.com/al_muslimah2/status/586643051868717057. “Islamic State is no more a country, it's a continent now. Ahadun Ahad!!! !” (Tweet)ana_eashaa, Twitter post, April 7, 2015, 1:15 p.m., https://twitter.com/al_muslimah2/status/585491188968513537. 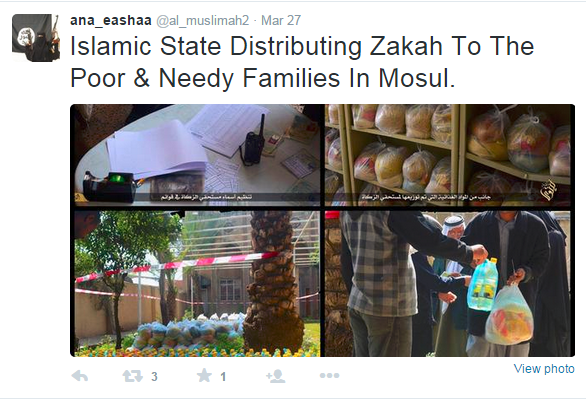 “Islamic State Distributing Zakah To The Poor & Needy Families In Mosul.” (Tweet accompanied by picture)ana_eashaa, Twitter post, March 27, 2015, 9:12 a.m., https://twitter.com/al_muslimah2/status/581443647645814784. “We talk ‘jihad fi sabilillah’ yet are complete cowards when it comes to the mere thought of sacrificing ourselves for His sake. #coconuts” (Tweet)ana_eashaa, Twitter post, March 27, 2015, 9:46 a.m., https://twitter.com/al_muslimah2/status/581452120832008192. “I'M BACK SONS OF KUFFFARRRR!!! accnt #3. Please share, as i forgot everyones username jazzakAllahumullahu khayran!” (Tweet)ana_eashaa, Twitter post, March 26, 2015, 12:49 p.m., https://twitter.com/al_muslimah2/status/581135913381679104.